The problem is my registy doesn't have an Explorer key under windows, rather only Internet Explorer and a few other things. I can't figure out how to turn Action center on because I need to change the battery setting. I also tried searching my entire registy for "Disablenotificationcenter" but doesn't exist. I also tried to find it in the settings menu which is supposed to be under notification and actions but can't turn it on there either. 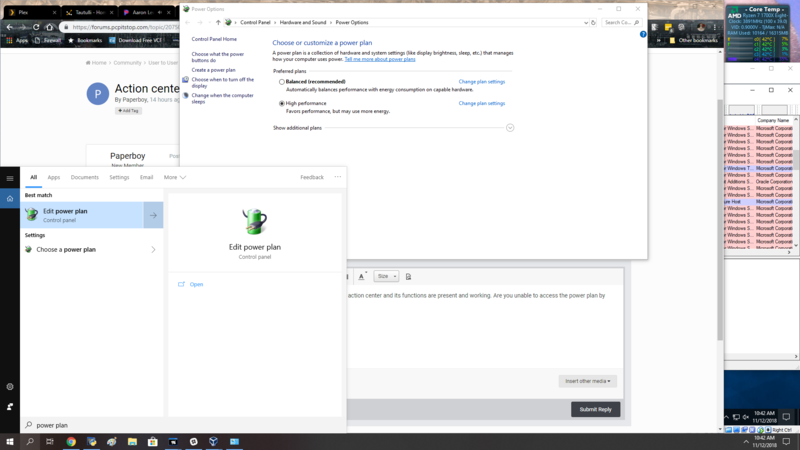 I can turn system icons on and off but the action center icon on the far right of my task bar does not show. I just checked my Win10 Pro box and that HKCU key sin't present on mine either, but action center and its functions are present and working. Are you unable to access the power plan by searching power plan from the search box like in my pic?